Chancellor, Vice-Chancellor, honoured guests and graduands, it gives me great pleasure to be presenting today Lizzie Ball, for the award of Honorary Master of the University. Lizzie was born in Hathersage, Derbyshire, and attended Lady Manners School in Bakewell in the Peak District. Music played a big part in her early life. Her mother had wide-ranging musical tastes and her father was an accomplished jazz pianist. At the age of seven Lizzie heard a violin being played on the radio and decided in that moment that the violin was the instrument she wanted to play. At the age of 10 her mother took her to see a concert by the violinist Nigel Kennedy and his totally unorthodox approach to classical music truly resonated with her. Lizzie became leader of the City of Sheffield Youth Orchestra age 15 and after achieving top-grade A Levels, gained a place at St John’s College, Cambridge, to read Music, followed by postgraduate studies at the Royal College of Music and the Guildhall School of Music, under the master violin professors Yossi Zivoni and David Takeno. Lizzie has learnt and absorbed a range of musical style in addition to her classical training ever since her time at Cambridge and in her mid-twenties starting adding vocals to her performance. Her desire to present classical music for a wider audience has led to collaborations with a host of well-known artists including Rod Stewart, Russell Watson, Kanye West, Adele, Ariana Grande, Kylie, DJ and Bestival founder Rob da Bank. Her increasing career caught the attention of Nigel Kennedy, and in 2010 he contacted her with an invitation to duet with him and to become the concert master (lead violinist) for the European tour of his newly-formed Orchestra of Life, a job which Lizzie continues to enjoy. Other highlights of Lizzie’s career to date include solo collaborations with Jeff Beck and Brian Wilson, Judith Owen with Bryan Ferry, Grammy-nominated classical choir New York Polyphony, accordion superstar Martynas Levickis and the James Pearson Trio from Ronnie Scott’s. Performance highlights include headlining as a soloist at Madison Square Garden New York for Eric Clapton’s Crossroads Guitar Festival, several critically acclaimed US tours of over 60 cities to date and directing the historical Palestine Prom for BBC Proms 2013, which involved the young Palestine Strings with Nigel Kennedy as soloist at the Royal Albert Hall. Lizzie is passionate about education projects and has given hundreds of workshops for projects over the years, involving visits ranging from private boarding schools to Pupil Referral Units. More recently Lizzie has been working locally with the brilliant Sheffield Music Hub on a number of projects, including an original commission for a brand new piece of music called ‘The Lone Star’ for Electric Violin and an orchestra of 200 children in partnership with Hugh and Ruby Sykes Charitable Trust. Lizzie is also Ambassador for PRISMA, an arts charity providing workshops to children in need in underdeveloped areas of Mexico. So far the project has reached over 10,000 children in just two years of existence. More recently, Lizzie has just given the World Premiere in early November at the Victoria and Albert Museum in London of her originally created Production ‘Corrido: A Ballad for the Brave’. This is an immersive audio-visual journey about the life and times of Frida Kahlo and her contemporaries, featuring Lizzie’s own compositions alongside Mexican and classical music pieces, paired with originally created animated film and video design - all in a unique collaboration with an extraordinary team of creatives. The premiere of Corrido was in association with the V and A’s acclaimed exhibition of Frida’s own personal items and clothing, named ‘Making Her Self Up’. 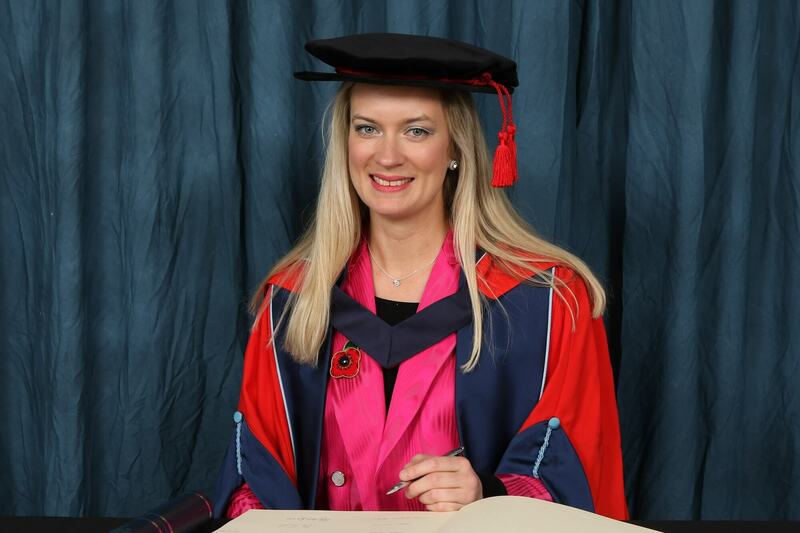 Chancellor, in recognition of her achievements in the field of music and her innovative and creative approach to classical music, we are delighted to award Lizzie Ball the honorary degree of Master of the University.